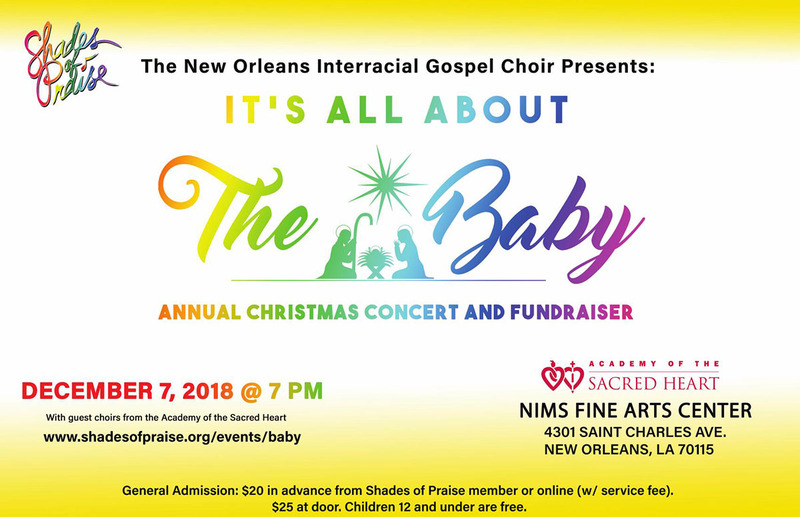 Join Shades of Praise, the New Orleans Interracial Gospel Choir, at a Christmas Concert/Fundraiser on December 7, 2018 at 7:00 P.M.
A New Orleans favorite for 18 years, Shades of Praise introduces gospel to wider audiences across racial and denominational boundaries and forge relationships that dispel stereotypes & create racial harmony. In addition to Shades of Praise’s inspiring gospel Christmas selections, the evening will be made merrier by guest performances by the Academy of the Sacred Heart’s Choirs. General admission seating – $25 at the door; children 12 and under are free. Doors open at 6:30 PM. $20 for advance purchase tickets: online from Brown Paper Tickets (with a $1.69 service fee) or directly from a Shades of Praise member. For those who are unable to attend but would like to support the mission of Shades of Praise donations are always welcome. If anyone would like to spread the word about this event: download the .pdf for an 11×17 poster. Parking is available on the street and in a free lot on the corner of Carondelet and General Pershing.